Our expectations couldn't be very high. But whether because of our pressure, or despite it, Europe has blinked. Bullied for years by Basel Action Network to implement the "Ban Amendment", Europe had shown a pattern of stimulus-response which I had failed to note ten years ago. So WR3A got less diplomatic in our language, to match the "ghoulish witchy skeleton toxic" language of Basel Action Network and Greenpeace. Where they claimed "Stewardship" we called out "Africa Boycott". Where the NGO's called out "waste tourists" we gave voice to "geeks of color". "Most of the illegal e-waste trade is taking place next door rather than far away in Africa," said Jaco Huisman of the United Nations University, scientific coordinator of the project that included police agency INTERPOL and other partners. That's right. Europe finally got a clue this summer. It took awhile, but the Dennis Moore analogy holds. This redistribution of environmental costs was trickier than thought. European Environmental Advocates really must be "word war weary" at this stage. Poor Pascal LeRoy and David Higgins couldn't help but bristle at being named personally in blogs to account for the environmental malpractice of the WEEE Guidelines, as implemented. Basel Action Network is known for developing "tests" which appear to allow trade - like allowing laptops with batteries that show 80% of original charge - a charge gone on many laptops after a few weeks. Or like allowing SKD factories to buy "fully functional" CRTs with parts removed. The proof in the pudding was that exactly 0% of their E-Stewards would export a CRT monitor, they were all pounded into toxic rubble following the breakdown of the California Compromise. But the point of sharing these technical anecdotes is to show the level of obfuscation faced by UNU, UNEP, PACE, StEP and other Euro Acronym Agencies in the Puckett Armada. They believed the lead ship knew where it was going. But after 10 years, short of supplies and weary of the "collateral damage" of Africa's Tech Sector, Europe today has blinked. Yesterday I mentioned Mr. Jim Puckett's Op Editorial in Resource Recycling - Exporting Deception: The Disturbing Trend of Waste Trade Denial. I will have a chance to respond in Resource Recycling next week, in simpler terms than I traditionally write by blog. The blog is directed at the best and brightest in our field. The masthead photo of Agbogbloshie, by Amaia Benito, shows three young men, standing near the side of the Odaw River Lagoon, burning auto harness wire. A 1990s CRT monitor case, used to carry the wire after burning, implies that there is e-waste, too. No doubt. When Wahab and Emmanuel and I interviewed the wire burners (27 at the site) last April, they estimated that 20-50 pieces of electronics arrived there each day. That is in the largest slum of a city of more than 3 million people. The hard working, poor men are not a hoax. The "e-waste" is not a hoax. The toxics are not a hoax. The import of second-hand devices isn't a hoax. These are specifically what Jim rebuts, and it appears he purposefully misses the point. I have never claimed the Odaw River is clean, or that we should ignore the environment in African cities, nor that Africans import second hand goods. What is a hoax is that 400-600 sea containers full of western waste is dumped at the site each month. 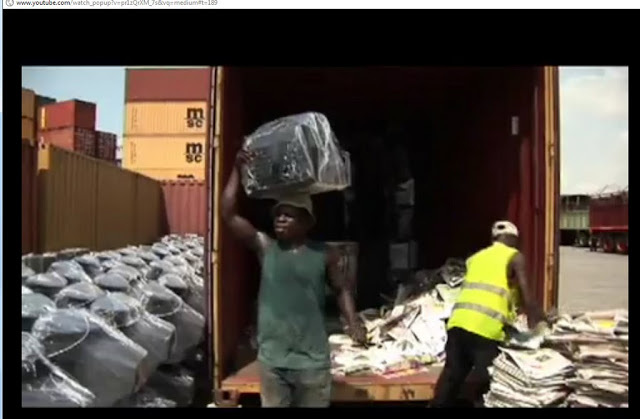 It is a hoax that the goods that Africans pay to import are quickly dumped 80-90% of the time. It is a hoax that the Basel Convention has been amended and the trade in repair is illegal. It is a hoax that Agbogbloshie's a very large dump, much less one of the largest in the world for "ewaste". And it's a hoax that "e-waste" ruined a pristine, lush, Odaw River. The exaggerations of Agbogbloshie trump the reality. I objected to the exaggeration of African import crime in an interview with Jim Puckett in 2005, but no one had yet studied his claims of "75%-80% dumping" (and he had then as yet to later deny his claim). Finding something I didn't say and responding to that, instead of what I did say, will fool some of the people, some of the time. Extensive peer-reviewed studies and World Bank reports on teledensity in Africa can't simply be labelled "denial" and "associated" with tobacco and climate change skepticism. And citing news sources that cited your own *claims* hardly matches wits with extensive research by Memorial U, ASU, MIT, and the UN. In his editorial, Jim Puckett has repeatedly accused me of "ad hominem" attacks. The claims he makes about Josh Lepawsky of Memorial University, Reed Miller of MIT, and researchers from US International Trade Commission aside... Jim would have a legitimate complaint if I have, as he implies in the article, called him a racist. If Jim has really misunderstood me, my apologies and condolences. But as likely he hasn't. Europe's EWaste Armada: Following Captain Puckett to the Edge? The logo to the right appeared in the NY Times Opinion Editorial section, in a n article by philanthropist Peter Buffett, titled "The Charitable-Industrial Complex"
" Between 2001 and 2011, the number of nonprofits increased 25 percent. Their growth rate now exceeds that of both the business and government sectors. It’s a massive business, with approximately $316 billion given away in 2012 in the United States alone and more than 9.4 million employed. "Philanthropy has become the “it” vehicle to level the playing field and has generated a growing number of gatherings, workshops and affinity groups. 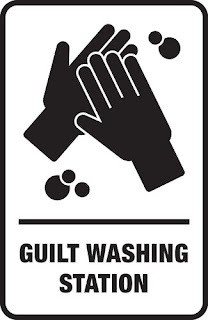 "As more lives and communities are destroyed by the system that creates vast amounts of wealth for the few, the more heroic it sounds to “give back.” It’s what I would call “conscience laundering” — feeling better about accumulating more than any one person could possibly need to live on by sprinkling a little around as an act of charity. "But this just keeps the existing structure of inequality in place. The rich sleep better at night, while others get just enough to keep the pot from boiling over. Nearly every time someone feels better by doing good, on the other side of the world (or street), someone else is further locked into a system that will not allow the true flourishing of his or her nature or the opportunity to live a joyful and fulfilled life." This #charitableindustrialcomplex meme, and #theafricathemedianevershowsyou, and #povertyporn and #parasitesofthepoor memes are not something I made up as an "ad hominem" attack on the Basel Action Network, which renewed the claim in an Op Ed this month at Resource Recycling. Jim makes some kind of association with climate change deniers, and tries to make the case that his poor non-profit is the victim of some kind of right wing conspiracy. If his #EwasteHoax is denied, and Climate Change is denied, then obviously .. uh what? 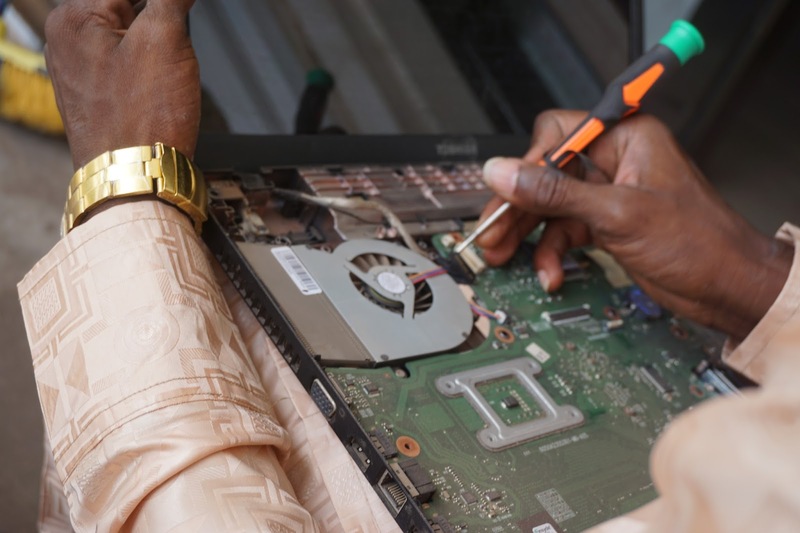 He goes through 3 studies that I've featured here on the blog which focused on exports of second hand electronics to cities in emerging markets, studies which found about 9% of what is exported may not be repaired. That "fallout rate" is documented in every industry, in "spoilage and breakage" statistics. If you export 100 tons of corn, and 9 tons spoil, did you "illegally dump" nine tons of corn waste? What is maddening is that Jim himself acknowledged the value of the study two years ago (before Hurricane Joe Benson was sentenced) and made the claim that it was better now thanks to his organizations "reform" of the trade. But when it was pointed out that the studies were done on the very containers his organization accused, leading to seizures, (BAN Spins: How the Basel Action Network "Saved" Africa) he never replied. We have had to attack the #ewastehoax, because he wasn't answering any questions or making any corrections, calling Joe Benson "collateral damage". In the latest version of BAN SPINS, we see a curious loop. So in defense against "deniers", he cites the very articles I cited... the ones which reported him making the specific claim that 80% of what Africans and Chinese buy isn't reused but illegally dumped and burned by orphans. Jim cites the organizations, which claimed the Hoax Statistics, citing Jim, which he denies giving them? Jim defends himself with the statistics quoted by those organizations citing interviews with Jim Puckett, who denied giving them the statistic? And this in an editorial calling African Technicians, calling Joe Benson innocent, "deniers". If Africans now have TV, radio, internet and cell phone use at rates competing with Europeans, it must be with brand new devices, since the used ones were dumped? Here are the guys going to jail. SMOKING GUN: Multiple Reports on Agbogbloshie, Ghana, source pollution!! 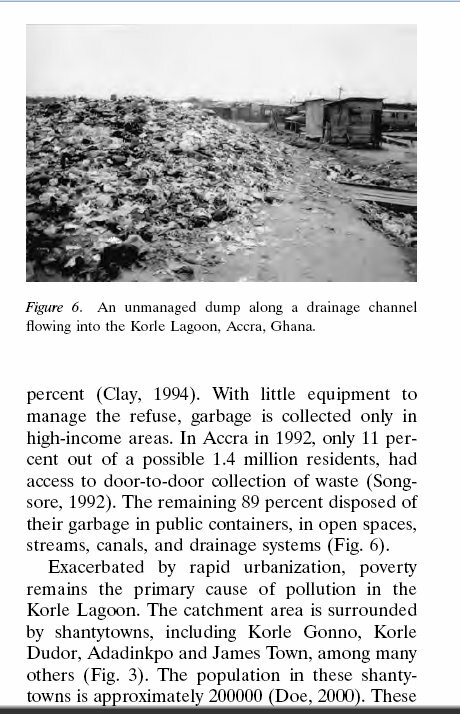 "Urban waste pollution in the Korle Lagoon, Accra, Ghana" ("Urban Waste") is an article that appeared in The Environmentalist in November, 2002. It was written by Markku Kuitunen and Kwasi Owusu Boadi at the University of Finland, following announcement of a major grant (mostly OPEC) to dredge the river and abate annual flooding. Anyone writing any report on E-Waste Crime in Agbogbloshie is incompetent if they don't do background research. 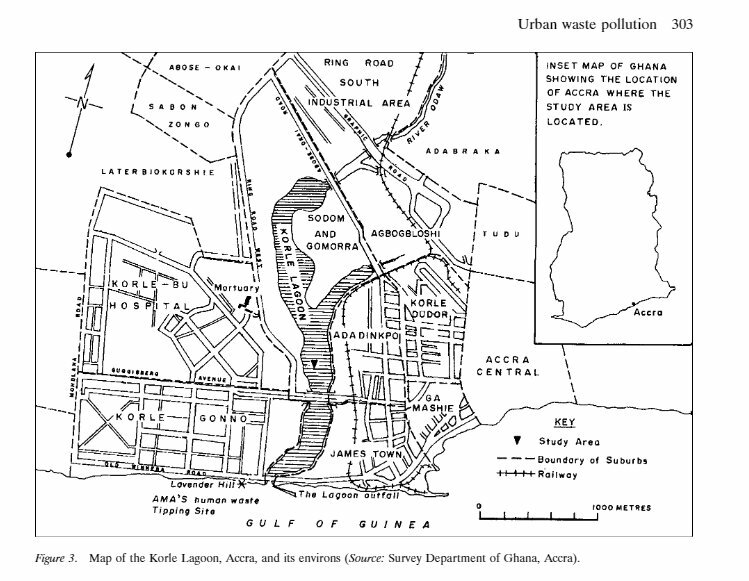 I don't have time to cite every one of these, but this one has a great bibliography, and is really a "smoking gun" for the Agbogbloshie "E-Waste Hoax", as well as a sobering account of past grants and efforts to "save Accra" from urban pollution. The pollution and flooding is described as a problem since the early 1970s and 80s, and is attributed to "rapid urbanization" of Accra, Ghana's capital city. "The Korle Lagoon in Accra, Ghana, has become one of the most polluted water bodies on earth. It is the principal outlet through which all major drainage channels in the city empty their wastes into the sea. Large amounts of untreated industrial waste emptied into surface drains has led to severe pollution in the lagoon and disrupted its natural ecology. The increased levels of industrial activity and consumption by the urban population lead to the generation of copious quantities of waste. Managing the volume of wastes poses a major challenge for the city authorities, particularly, ensuring that all the waste generated is collected for disposal. In Accra, the Waste Management Department is currently capable of collecting only 60 percent of the waste generated daily. The rest is dumped in open spaces, in surface drains, and into water bodies which end up in the Korle Lagoon. High eutrophication levels have developed in the shallow water body. The net effect is that, at the slightest downpour, the lagoon overflows its banks causing regular flooding in parts of the city. The article stresses that problems cited in two previous studies (Biney, 1982 and Mensah, 1976) had continued to increase, and that by the time of the 1976 and 1982 studies, the lagoon was dead. As Accra (and Lagos, Douala, Nairobi, Kinshasa, etc.) has grown, so has pollution from the waste generated by people who live there. Before the onset of this severe pollution, and in the early 1950s, the lagoon supported a thriving fishery of both fin and shellfish, which served as a source of employment and income for some people in the nearby shantytown, which incidentally derives its name from the lagoon. However, due to the grossly polluted state of the waters, the lagoon has lost its fishery (Biney and Amuzu, 1995), and it is hard to believe that this black, nauseating muddy water could ever have supported any such life. The Korle Lagoon is the major basin into which the greater proportion of the flood waters of Accra flow before entering the sea (Biney and Amuzu, 1995). The lagoon receives water from a total catchment area of 400 km2. It receives discharges from three main sources—the Odaw River and two major drains on its eastern and western sections (Fig. 3). These major drains are mostly uncovered and usually collect silt and debris which are transported into the lagoon (Mensah, 1976). Waste discharges, including industrial effluent, are the major sources of pollution. The wastes originate from residential, commercial and recreational areas, offices and institutions, such as hospitals and schools. They include food waste as well as paper, batteries, glass, plastics, textiles, excreta aerosol cans, and much more (Biney, 1982; Mensah, 1976). So Mike Anane's descriptions of the "E-Waste Tragedy" starting with bad e-waste exports in Europe is late to the game. Here are descriptions of the dumps upstream of the river, citing reports from Amuzu 1976, Laing 1994, etc. "The water in the upper part of the lagoon is muddy, and the stench emanating from it is unbearable. An abundance of saw mill dust from the timber market industrial area is disposed into this part of the lagoon. Also, the Waste Department's dump which is covered with industrial sawdust, is gradually encroaching into the water body. Sediments in this part of the lagoon trap effluents from upstream. These include industrial, domestic, and hospital wastes which have further deteriorated the water quality upstream. According to Liang (1994; 141), a survey of manufacturing industries in the Greater Accra Region showed that the metal industry creates 16 percent of the total industrial waste, garment and textiles - 30 percent, chemicals and cosmetics - 20%, electricals and electronics at 1 percent and mineral products at 0.7 percent. Most of the untreated industrial waste waters are discharged into surface drains which flow into the Odaw River and Korle Lagoon. Since the upstream part of the lagoon is the usual point of discharge, and the receptor of wastes, it is the most affected." So we knew in the 70s, 80s, and 90s that the lagoon was already polluted and dead, and that the source of the pollution was upstream of Agbogbloshie. And the 2002 study estimates the contribution of electric and electronics as contributing 1%. I'm not saying that Accra isn't polluted, and I'm not saying that pollution isn't tragic. But accusing African Techs, Geeks and Nerds, or Dagbani scrappers, of making this mess amounts to not much less than criminal defamation. So certainly ownership of second hand electronics increased in Ghana homes, certainly teledensity increased, as did pollution, sewage, and people throwing batteries and car stuff in the gutters and river. But arresting internet cafe owners, TV resellers, cell phone repairers, etc. seems like the most hideous, disgusting, moronic solution to the problem that anyone but a planned obsolescence industry could come up with. And the Urban Waste Pollution articles bibliography, on page 309, involves numerous water studies of the Odaw River and Ghana pollution. Not a single one of these, however, is cited in Greenpeace (Poisoning the Poor), Basel Action Network (Digital Dump), or Blacksmith Institute (aka Pure Earth) report with CUNY. I have a lot of intelligence. As in, on stuff. Intelligence in use in the phrases "military intelligence" and "business intelligence". It's information. But it is actual intelligence as well, and when you have it, many people will mistake you for "being intelligent". People who think, or suspect, that one is not intelligent will doubt or claim not to have understood the intelligence. And they have a point... a lot of "snake oil salesmen" were behind the phrase "snake oil salesmen"... society has a lot of experience with people who obfuscate or dazzle with rhetoric, or fake statistics, phony studies, in order to garner a following. Often it's for profit, but some people do it for other "currency", like moral approval or fame, or simply to hide something, dodge shame. Growing up in Western Christian culture, I'm very familiar with the incentives and disincentives offered by the Gods of Emotional Appeal. You will feel "joy" if you are righteous, or at least "satisfaction". We are promised sorrow and pain if we sin, or the sins are depicted surrounded with imagery of sadness in the Christian media. I'm a silent Believer. I remain religious, or spiritual, since the "born again" experience I had in Arkansas as a pot-smoking teenager. But from the beginning, it was not an "us vs. them" experience... I was also changed positively (enlightened) by the Bhagavad Gita, the Tao, and refined my beliefs Buddhism. Buddhist writers described "spiritual materialism" to describe the economy of emotions. But the quiet, non-evangelical Believer, accomplishes much. It is the deeds, the karma of her life, which measure the Christian Sage above the greedy, the exploiting, or spiritually wretched. Ethics. This blog is about Ethical Environmentalism. What the truth is, is important. But Ethics without a belief are as useless as Ethics with wrong "knowledge". Our time on earth is about choosing aims, aiming, and meeting those aims. We can't aim and shoot a bow without both gravity and light. Faith and truth.